Debutant Iago Aspas' second-half curling strike aided Liverpool to a comfortable 4-0 win over Preston North End in their Shankly Shield match at the Deepdale Stadium. Jordon Ibe also scored his first senior Reds goal in what was a resounding win in Brendan Rodgers' side's first pre-season game ahead of the 2013-14 campaign. 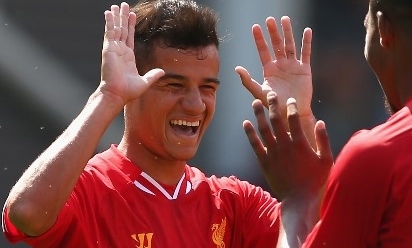 New signings Luis Alberto, Simon Mignolet and Kolo Toure also featured as further composed finishes from Philippe Coutinho and Raheem Sterling helped ease the visitors to victory. Amidst the intense heat within the ground, Daniel Agger was the first to test Lilywhites custodian Declan Rudd with a typically well-struck long-range drive. The Dane - who was installed as captain for the day - drilled a stinging 30-yard shot that Rudd could only parry, before Preston quickly reacted to clear the danger. Liverpool's constant pressing paid dividends in the 13th minute when Coutinho forced former Reds midfielder John Welsh into giving away a penalty. The North End captain hesitated in possession deep into the home side's half before the determined Brazilian stole the ball away from him. In a desperate bid to regain possession, Welsh hauled the 21-year-old to the ground - leaving the referee no choice but to point to the spot. After dusting himself off, Coutinho stepped up to casually tap the spot-kick into the corner - sending Rudd the wrong way in the process. A period lacking goalmouth action ensued before Liverpool began re-applying pressure on Preston's backline. Fabio Borini side-footed an inviting opportunity wide when surging through on goal before Ibe proved to be ruthless minutes later. The energetic youngster skipped inside from the left flank before rifling an unstoppable low effort that crashed into the back of the net at the near post. The second half brought wholesale changes to both sides, with Aspas and Alberto donning the red shirt for the first time. Substitute Sterling - who made his comeback after a long-term injury - displayed unwavering desire to hit the target when bursting down the left wing. The youngster forced his way into the opposition's box under pressure from Tom Clarke before he held the defender off to curl a strike towards the far corner. Unfortunately for the 18-year-old, replacement goalkeeper Thorsten Stuckmann threw himself across the face of goal to glance the ball off target. Sterling admirably continued his search to extend Liverpool's lead and was rewarded for his efforts with little over 25 minutes remaining. A rapid passing exchange between him and the impressive Aspas sliced open North End's defence, allowing Sterling to race past the helpless Stuckmann and tuck the ball into the gaping net. The Reds' pressing did not relent and after getting an assist, the hungry Aspas found the net himself in eye-catching circumstances. The Spaniard remained composed 25 yards from goal before he calmly swept a curling shot that soared over Stuckmann and into the far corner of the net to round off a pleasing day for Rodgers' men.